Adding plyometric drills to your upper body golf weight training program will help you develop the quickness and explosiveness needed for a powerful, proper golf swing. If you are unfamiliar with plyometric drills, here is a quick overview. These exercises are intended to be performed quickly, with fast, yet strong, muscle contractions. They typically are more sport specific than traditional strength training exercises due to this nature. They are great to add to your workout routine in order to challenge your muscles in a different way in addition to breaking up the monotony of your normal program. Targeting these upper extremity muscle groups will help lead to a more powerful downswing, and hopefully more distance to your shots. -Add a new twist to this traditional exercise. Begin in the standard push up position, and after you lower your upper body towards the ground, push up as rapidly as you can and try to get airborne! -This is a very difficult exercise, so don't worry if you can't do it immediately. Also, if you are able to do it, you may only be able to perform a few reps at a time. -For this exercise, you will need a medicine ball and either a wall or a partner to catch. This exercise mimics a soccer throw in. -Start standing, with the ball held in both hands overhead. -Move the ball slightly behind your head by bending your elbows and then rapidly throw the ball forward either to a wall or your partner. 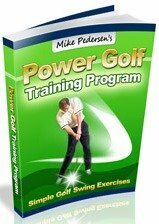 This will help generate force during the golf swing. Start standing, with the outside of your left shoulder facing the target. -Have your feet shoulder width apart to create a solid base, and hold the ball with both hands off to your right side. -Quickly rotate your trunk to the left and throw the ball to your target. Repeat to the other side. -Good for chest and tricep strength. Face your target and hold the ball with both hands at chest level. -Have your elbows wide and forcefully push/throw the ball forward to your target. -Place either small boxes (or even textbooks), of a couple inches in height, on the ground slightly wider than shoulder width apart. -Situate yourself in a pushup position with each hand placed on one the the boxes. -Quickly remove your hands for the boxes at the same time, and move them to the ground, absorbing your body weight through your elbows when you land. Then return to the starting position. -To make this more difficult, you can increase the height of the boxes and/or try to jump yourself back up onto the boxes after landing. Try adding these plyometric drills to your golf weight training routine, but remember, they are not designed for everyone! Don't push yourself past your limits, or else you'll be visiting the golf injuries page on this site!